I suppose it’s about time that I explain why I call this website, Call Me Tulip. When I was a child, my maternal Grandmother Midge called me her little Tulip. Eventually, I began calling her my Grandma Tulip. Tulips have always been special to me. They are my favorite flower and you can only get them two times a year. In December and in the spring. It is not lost on me the coincidence that grandma died in December when Tulips were available for her funeral. 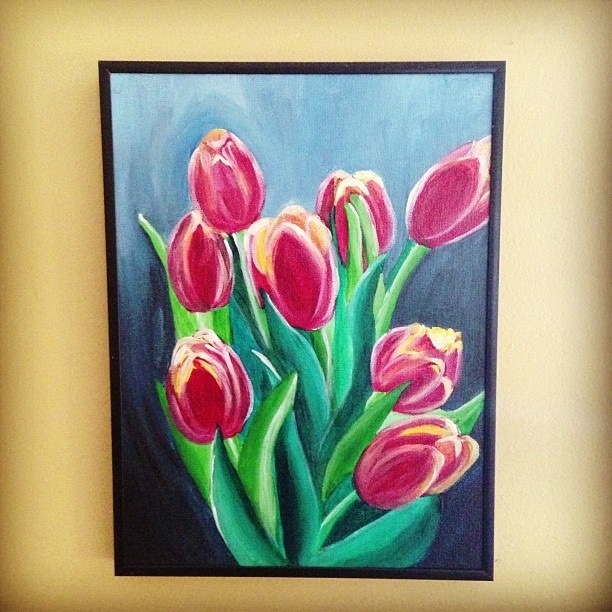 Tulips, 2005, I painted after she passed away. My grandmother and I always had a very special relationship. I was the first to make her a grandmother. I have heard stories of my infancy when my grandmother was the only one that could soothe me when I was upset. As a child she had a magical quality. She could always make things better. I always remember feeling loved and protected by her. She taught me so many things. She was the first lover of art that I can remember. She taught me and my sister to paint, sew, garden, cook, and so much more. She took us to concerts, theater, and even to Europe. Up until her death I spent every Wednesday night having dinner with her and talking about anything and everything. Her life was not always pleasant, but she made the best of it, and when she died, she was ready to go (she told us). She passed away in 2004 of cancer. Yesterday, as I was walking into Target to pick up some toothpaste there was a table full of fresh cut flowers and right in the center was a very large bunch of Tulips. This is not a surprise as they are in season right now, but at the moment I walked in the door it was the only thing I saw. It was like there was a spotlight pointing to the display. I know that she was there in that moment giving me comfort, saying hello, wishing me a Happy New Year.